Starting an Etsy shop was one of those "pipe dreams" I had after graduating college. Etsy was still relatively novel (June & January and Freshly Picked were both still Etsy shops at this time!) and the idea of starting a shop was enough to keep my creative brain working full time. I was a full time designer at Amazon and the corporate life was just not for me. I loved the people I worked with, but had dreams of staying home & raising babies (how GREAT is God - I'm living my greatest dream). I quit my corporate job to hopefully pursue freelance designs and opened up HEN & CO. in between. I started with wedding invitations (we had just gotten married a few months before) and as life progressed, so did my little shop. I designed my first baby onesie when I found out I was pregnant with Baylor, and my apparel and stationary has just grown with our family. I've learned a few things over the last 7 years of running my shop and thought I'd share them with you, in case you're thinking of starting up a shop of your own! 2. QUALITY PRODUCT: Just because it's ETSY and you could list virtually anything on there, doesn't mean you product shouldn't be Nordstrom quality. Make sure you're selling something that you would be happy to receive. It's worth it to pay a little bit more in production and raise your prices than to have a lower-quality item at a lower price point. When you deem your item valuable, it automatically assumes that value to the buyer. 3. LOVE WHAT YOU'RE DOING: PASSION you guys. If you are selling keychains and hate your life because of it, that will come through in your product, in your shop and in your customer service. For example: I started this business doing wedding invites and grew to a place where I loathed when someone would order a wedding invitation. So much so that I would put it off, I would rush through it, etc. It showed. Once I acknowledged this, I quit selling wedding invites, quite working with bride(zilla)s and felt SO good about my decision. Even though that was a great source of income and business for my shop, it was NOT WORTH IT. 4. SNOWBALL EFFECT: Starting a business takes a long time. It takes patience, persistence, and passion. If you think you're going to get 1,000 sales off the bat, girl you cray. Now, there are those one-off situations where something goes viral and spreads like wildfire, but let's not go into business with this expectation, k? Hustle, dream and grind and I promise you, if your product is good, the sales will follow. 1 sale will turn in to 5, 5 will turn into 20 and so on & so forth. 5. 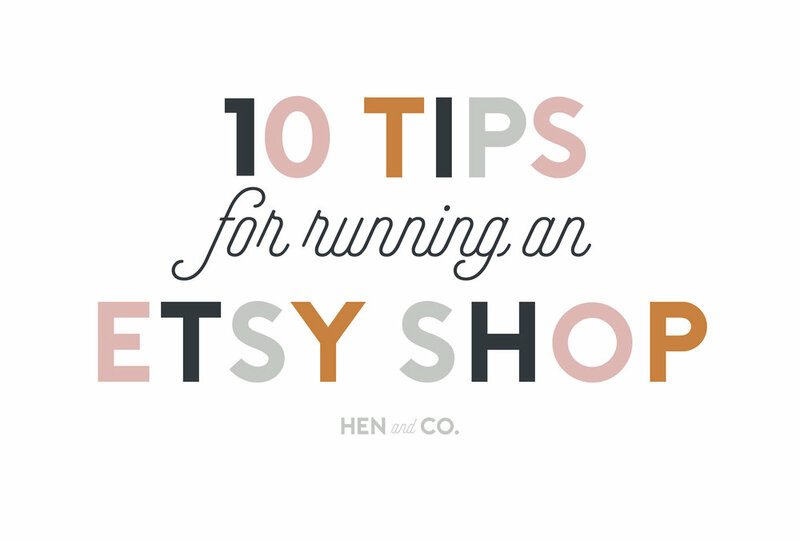 GRIND: Running an Etsy shop is not a hobby. It can be if you want it to, but if you're looking to make 6 figures, then expect to work it like a job. 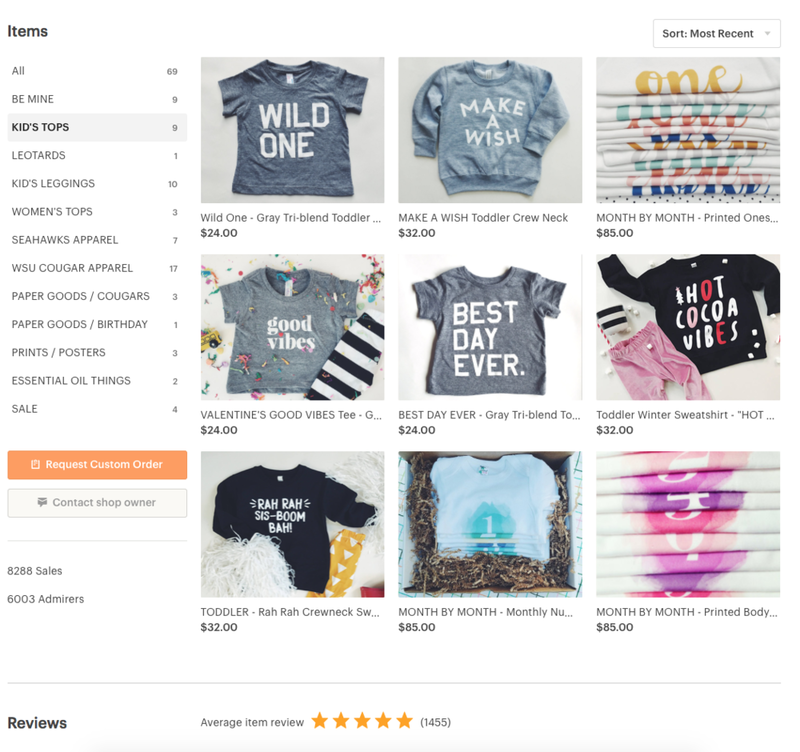 I quit my full-time job at Amazon to start an Etsy shop and have worked infinitely more hours than I did at my corporate job. I've worked until 2 am more nights than I'd like to admit, I've worked weekends and mornings and vacations and every minute in between. If you don't have the hustle and determination to make this work, it's not going to work for you. 6. SHARE/ENGAGE: If you're going to have an online business, you need an online presence. Engage via social media with your customers - follow moms that might want to buy your onesies or men who need your leather wallets. Build relationships, not just followers. Send free product to influencers (AND EXPECT NOTHING IN RETURN ... just because you send it does NOT mean they have to post it!) and share freely - you never know what will catch on. 7. MARKETING: Put yourself out there! Whether you're using Facebook/Instagram ads, Pinterest, sharing your shop via local businesses or just self-promoting wherever you are, MARKETING is IMPORTANT. How would you know Chipotle sells burritos if they didn't tell you?#chipotleisalwaysonmymind How would you know that J.CREW has that swimsuit you NEED without seeing it in an AD? You have to market yourself. There's a million and one ways to do this and it will be worth the money. 8. FIND A MENTOR: Guess what? There's a million shop owners that have come before you. LEARN from them! Message someone you respect in your field and ask them to be your mentor. Ask them advice, feedback, how they do this or that or just some guidance. This can feel awkward or uncomfortable to ask of someone, but 9 times out of 10, you will be blessed by this experience. We can learn SO much from each other. 9. EVOLVE: Here's the deal - You have to listen to your market. I started this business doing wedding invites and here I am running a full apparel shop. My shop has evolved and changed SO much over the years and I could have easily said "nope, I"m a wedding shop!" but I would have missed out on SO MUCH. Be open to suggestions, listen to feedback, grow & evolve. You'll be better for it and your shop will too! If something's not working - try something else, just stay on brand! 10. CUSTOMER SERVICE: Feedback on Etsy is your lifeline and if you piss your customers off, it will show. We all mess up, have a bad day or make mistakes .. but OWN it. SERVE your customers, be loyal to them and treat them like you want to be treated as a customer. They're taking a risk buying from you and you need to respect that. If you mess up their order, refund them. If I refund an order, I will often times still ship it. I want them to understand that they're valuable to me and that I am GRATEFUL for their business! Running an Etsy shop has blessed my family in countless ways, and I am so grateful for what it's provided me. I get to stay at home with my babies, do something I'm passionate about and provide income for our family.